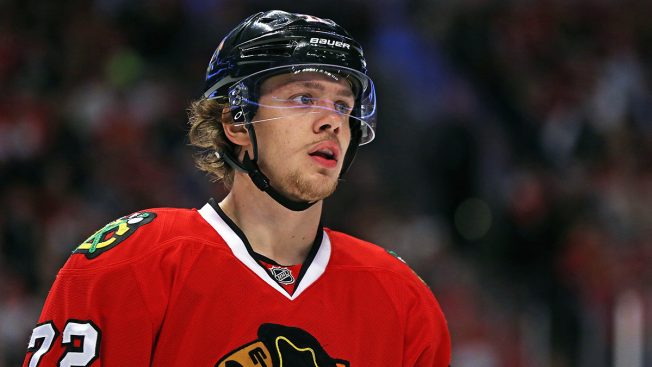 Artemi Panarin and the Chicago Blackhawks agreed to terms Wednesday on a $12 million, two-year contract extension. The reigning Calder Trophy winner will count $6 million against the salary cap in the 2017-18 and 2018-19 seasons. Agent Tom Lynn confirmed the deal in an email to The Associated Press. Panarin has 114 points in his first 117 NHL games. The 25-year-old Russian winger had 30 goals and 47 assists as a rookie last season, and has 15 goals and 22 assists in 37 games this season. The former Kontinental Hockey League star who went undrafted and signed with the Blackhawks two summers ago is fifth in the NHL in scoring at almost the halfway mark of 2016-17. While not the long-term contract that many expected, the bridge deal keeps Panarin in Chicago along with core players Jonathan Toews, Patrick Kane, Marian Hossa, Artem Anisimov, Duncan Keith, Brent Seabrook, Niklas Hjalmarsson and Corey Crawford. The Blackhawks have over $59 million committed to those nine players for next season. Panarin, who was a point-a-game player in his first appearance in Stanley Cup playoffs, conceded on a long-term deal to keep Chicago's championship window wide open. He'll still make more than countryman Nikita Kucherov, who re-signed with the Tampa Bay Lightning for an average of $4.67 million over three years.